Deshaun Watson plays as a quarterback for the Houston Texans of the National Football League (NFL). He may not be old in the business but he has made a significant impact since he officially joined the prestigious NFL in 2017. The quarterback went pro after he was selected by the Texans in the first round of the 2017 NFL Draft. There is so much more to know about the talented player apart from his professional career. Here are lesser known facts about Deshaun Watson. He was born on September 14, 1995, in Gainesville Georgia. Watson started from a very young age to exhibit an inclination towards the game of football. He is an alumnus of Gainesville High School. At the school, Watson was very popular in football and was a significant part of the school’s football team. Starting out as a freshman quarterback, he recorded awesome achievements which included 17,134 total yards, 218 total touchdowns, and 155 career passing touchdowns at the state level. His impressive feat during his junior year earned him lots of recognition and titles including the Junior All-American, 2014 Player to Watch, and many other accolades. His sophomore and senior years were also impressive with several record-breaking feats. After a successful high school stint, Watson got several scholarships offers from different universities but later went with Clemson University. Joining Clemson in 2014, Watson started out as a true freshman and a back up to former player Cole Stoudt. One of his remarkable records in his freshman season was his record-breaking feat of 6 touchdown passes, 435 yards in a 50-35 victory against North Carolina Tar Heels. He also made 29 out of 41 passes for 479 yards, and four touchdowns through three games. After sustaining an injury, Watson bounced back in his sophomore year and led his team to a 12-0 record. After the 2015 season, history recorded him as the first Clemson player to be invited to the Heisman Trophy presentation. In his junior year, Watson recorded great achievements including his 306 passing yards, five touchdowns, and three interceptions in the 42–36 victory against Louisville. The talented player was selected as the winner of the Johnny Unitas Golden Arm Award and also won the Manning Award. He helped the Tigers win their second national championship after a three-decade drought at the 2017 College Football Playoff National Championship. Deshaun bowed out of the team in 2016 when he graduated from the university. Before his graduation, he declared his intention to go pro. Watson went pro in 2017 when he was selected by the Houston Texans in the first round of the 2017 NFL Draft. Prior to the draft, the talented player was projected by many analysts to be a first-round pick and was also ranked as the top quarterback on various platforms. After signing a four-year, $13.84 million contract with the team, he made his first appearance in September 2017 in the game against the Jacksonville Jaguars where he pulled his first NFL touchdown. In his fourth week with the team, he became an AFC Offensive Player of the Week. He went on to clinch the AFC Offensive Player of the Month as well as the NFL Offensive Rookie of the Month in October, after impressive performances in different games. Watson recorded 1,699 passing yards, 19 touchdowns, and 8 interceptions in 7 games. Deshaun Watson underwent a knee surgery in November 2017 but soon bounced back after he missed a few games. He also had an arm injury that kept him off the pitch for a while. This quarterback finished his rookie campaign with 1,699 passing yards with 19 touchdowns, 269 rushing yards, and 2 rushing touchdowns. Deshaun Watson has $9.71 million as his career earnings for over two seasons. Meanwhile, he got a whopping $8.25 million as signing bonus when he made his pact with the Houston Texans. Several figures have been quoted as his net worth but we are yet to authenticate any of them. Deshaun isn’t the only child of his parents Deann Watson (mother) and Don Richardson (father). The NFL player has four siblings including his sister Tinisha Watson and two brothers, Detrick Watson and Tyreke Watson. 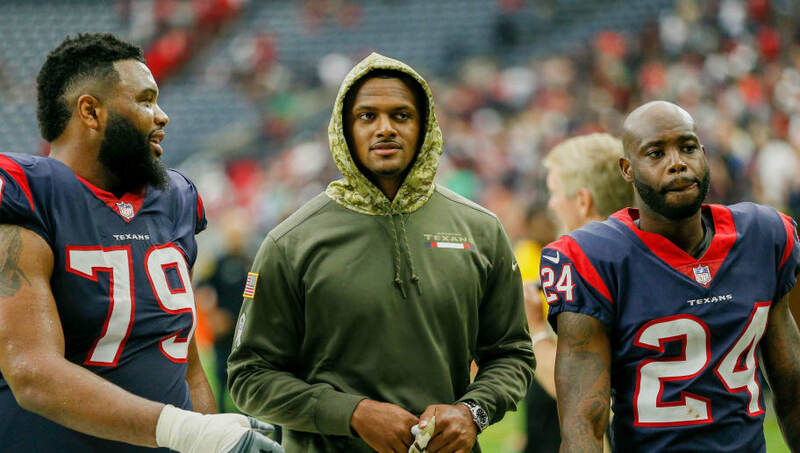 Deshaun Watson may seem so entangled and busy with his professional career, but the NFL player like his counterparts makes out time for his love life. Watson is said to be dating his longtime girlfriend, Dallas Robson. Both from Gainesville, Georgia, the couple attended the same high school in Gainesville and have been dating since then.